The versatile rice plant grows both in dry land and in flooded paddies. Like other grain crops, most rice is an annual, planted each year. 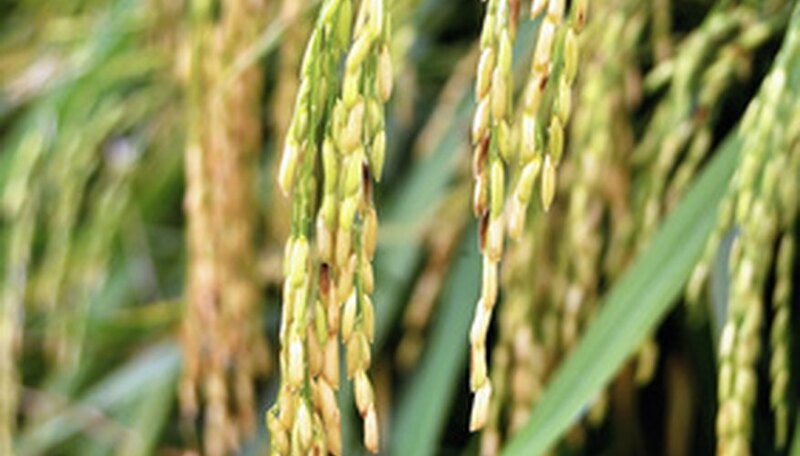 Under ideal soil and climate conditions, a few rice varieties will grow for several years. The International Year of Rice 2004 website reported that some 140,000 cultivated varieties of rice exist today. Any statistics involving rice are staggeringly high, proving rice to be a crucial food crop for much of the world's hungry. Everything a rice plant needs to make another rice plant is literally contained inside a grain of rice. The rice grain is the seed in which germination of the embryonic plant takes place. Inside the seed is a starchy storehouse comprised of an endosperm that supplies the embryonic plant with its energy. A nutrient- and vitamin-rich bran surrounds the endosperm, and a hard, protective hull encases the bran. As the rice seed begins to germinate, usually floating atop soil in watery surroundings, a root known as the radicle emerges from the base of the seed and reaches down into the soil. The coleoptile--the first shoot that reaches up toward the sun--emerges from the top of the grain. Roots continue to grow and multiply. The initial shoot branches off into a primary, then secondary leaf. Green shoots appear above the surface of the flooded paddy about 10 days after initial germination. A seedling rice plant eventually develops a segmented stem called a culm. The stem of a rice plant reaches up to 46 inches. Spiky, bladelike leaves grow from nodes that form on the culm. As the plant's stem grows continually upward, and the fibrous roots shoot farther down into the soil, the plant begins to take in minerals from the soil and produces the carbohydrates it needs through photosynthesis. Until the rice plants are well-established, the paddies in which they grow are kept flooded with water. Many farmers in Asia transplant rice plant seedlings that have been started in a bed used for germination. Rice farmers maintain about 6 inches of water in the rice paddies during this stage.The Ricegrowers' Association of Australia states that most of their rice is broadcast by aircraft over prepared, water-logged fields. About a month and a half after initial germination, spikes or panicles form and begin to emerge from the plant stem. These panicles will eventually form the flowering seed head. As the panicle continues to grow for several weeks, it flowers, starting at the top of the panicle then working its way down to the bottom of the spike. The flowers busily self-pollinate shortly before opening each morning until midday. Rainy, cool or overcast days interfere with pollination, postponing the process until the sun shines. Flowering and pollination usually last for about a week and a half. The total time from germination of a rice seed to harvest is about six months. After flowering and self-pollination, rice kernels appear and reach their peak size and weight about 35 days later. Rice farmers allow the soil to dry out before harvest; the rice plant uses up the water as the kernels grow longer, wider and plumper. Whether machine-harvested or hand-harvested, the grain is cut from the long stem or stalk and allowed to dry. Threshing separates the rice kernels from the plant, and the kernels are then milled to remove the outer hull for brown rice, or both the outer hull and the bran for white rice. Not only is milled white or brown rice consumed by millions of people daily, but the rice kernels, rice stalks and leaves can be processed in many different ways. Fermented rice kernels are the basis for beer or rice wine, also known as sake. Rice plant byproducts are turned into paper, rope, packing material and more.